First melt the butter in a large skillet, then add the onion and celery. Saute for about 5 minutes, until it begins to soften. Add in the herbs, and if the mixtures feels a bit dry, add in the olive oil as well. Next, add in the Pepperidge Farm unseasoned cube stuffing. Pour the whole bag into the skillet. Carefully toss it all together. Add in 1 1/2 (one and a half) cups of the chicken broth and carefully toss to coat as much as you can. Add in the dried cranberries and the pecans and toss. Bit by bit, add the remaining broth until it begins to bind but does not get soggy. You may or may not use it all. At this point you can season with salt and pepper if you desire. If you like to stuff your bird, go ahead and use some of the stuffing to loosely pack the bird's cavity. Don't pack it too tight! Put the remaining mixture into a baking pan (use a 13x9 if not stuffing the bird, or a 9x9 if you are) and bake it, covered with foil, at 350 F for 20 minutes. Remove the foil and bake another 10-15 minutes if you like the top to be a bit crispy. 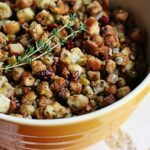 This recipe for Stuffing with Parsley, Sage, Rosemary and Thyme was printed from AmandasCookin.com - https://amandascookin.com/stuffing-parsley-sage-rosemary-thyme/ and can only be printed for education or personal use.